Blind nut / blind bolt anvil, extended length, ''C'' type driving tool. 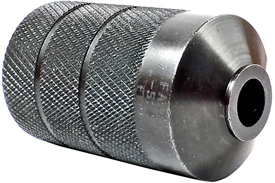 This extended length anvil is manufactured with hardened tool steel. This anvil is a component of the Blind Nut ''C'' Type extended Driving Tool assembly for use with a Hi-Shear® BH86 & BG2500 hydraulic power gun. Anvil heads are designed to seat against the shapes and diameter sizes of the sleeve heads of blind nuts and blind bolts.